Dad's got the camera. Mom's packing the sunscreen. The kids are dashing to the subway. 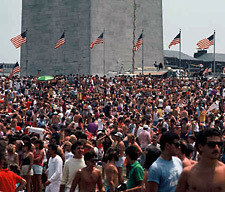 Summer in Washington, D.C. ... time to bask in great American tradition and history, right? The museums and memorials on the Mall in Washington are about to elbow out your everyday American family. The area is simply overcrowded and becoming more so each year. Sure, the stretch from the Capitol to the Lincoln Memorial remains an inspiring vista, but in its midst is such a clutter of other monuments, security barriers and commercial kiosks that you'd swear you were visiting an amusement park loaded up with Twist-a-Ramas and cotton candy stands. What happened to the stateliness? The place where visitors from Idaho and Germany alike stop, reflect and breathe in America? Now the District of Columbia's delegate in the House, Eleanor Holmes Norton, is preparing legislation to expand the Mall beyond its Capitol-to-Lincoln stretch. If done correctly, the extra space would solve many of its problems. But here's the catch: The expansion needs to be an official part of the Mall, not some dumping ground for "lesser" memorials. Otherwise, every group seeking a monument or museum will want it right along the traditional Mall. Congress also should involve the public. The Mall expanded as the 20th century began, thanks to visionaries like landscape architect Frederick Law Olmsted Jr. There's no reason it can't gracefully do so again - and with room to grow.